The story takes place in a small Irish village during the 1916 Easter Rising. A young woman (Sarah Miles, Those Magnificent Men in their Flying Machines), who is married to the local school teacher (Robert Mitchum, The Night of the Hunter), sets in motion a series of tragic events when she begins a clandestine affair with a British officer (Christopher Jones, Three in the Attic). Much-maligned big-budget romantic epic is in desperate need of reappraisal. Ryan’s Daughter, a loose adaptation of Gustave Flaubert’s Madame Bovary, was heavily criticized for its grandeur. The criticism — East Coast film critics were particularly nasty — was so severe that director David Lean, humiliated and embarrassed, went into a fourteen-year exile, and the bad press further damaged the moribund Metro-Goldwyn-Mayer, the studio that had bankrolled the film. Now we all can sit back, relax, and evaluate Ryan’s Daughter for what it is, not for what people were expecting. I personally think that not only most of the criticism was unwarranted, but also nonsensical; if this is what failure looks like, please, give me more of it! On the surface Lean appears to be showing off his skills as a visual storyteller, but that’s not the case, really. There is so much going on here. And the film raises important issues that are still relevant today. The soldier’s post-traumatic stress disorder (PTSD) and his inability to cope with his life after combat is something we understand much better now. Ryan’s Daughter also works as a coming-of-age story — the young bride does a lot of growing throughout the course of the movie. In addition to all that, Ryan’s Daughter explores the interaction between individualism and collectivism. I even learned a thing or two about the Irish-British conflict. Lean and writer Robert Bolt (Lawrence of Arabia and Doctor Zhivago) mixed together these elements in a fluid manner. So, in my opinion, anyone who accused Lean of delivering an overly padded storyline is not paying much attention. There is one thing that everybody agreed on: Ryan’s Daughter is a big production with truly spectacular visuals. You can clearly see where all the money went to. The sets feel authentic (an entire village was constructed on Dunquin, Ireland) and Freddie A. Young’s (You Only Live Twice) Oscar-winning camera work is moody and stylish. Young developed a special technique — he modified a ship’s clear screen — in order to capture a storm. Maurice Jarre (A Passage to India) provides another brilliant music score. The acting is top-notch. Sarah Miles (Mrs. Robert Bolt) gives a tremendously effective performance. John Mills (Hobson’s Choice) received an Oscar for playing the proverbial “village idiot,” but I thought Trevor Howard’s (Brief Encounter) no-nonsense Catholic priest was even better (Howard got the part only after Alec Guinness turned it down because he found the role “offensive”). Lean had lots of problems with Robert Mitchum (Lean wanted Paul Scofield, A Man for All Seasons), whose reputation for being lazy drove the perfectionist director crazy. Lean also clashed with Chris Jones. But Mitchum and Jones are very good, so the behind-the-scenes problems didn’t affect the final product. The cast also includes Barry Foster (Alfred Hitchcock’s Frenzy) and Leo McKern (Richard Donner’s The Omen). 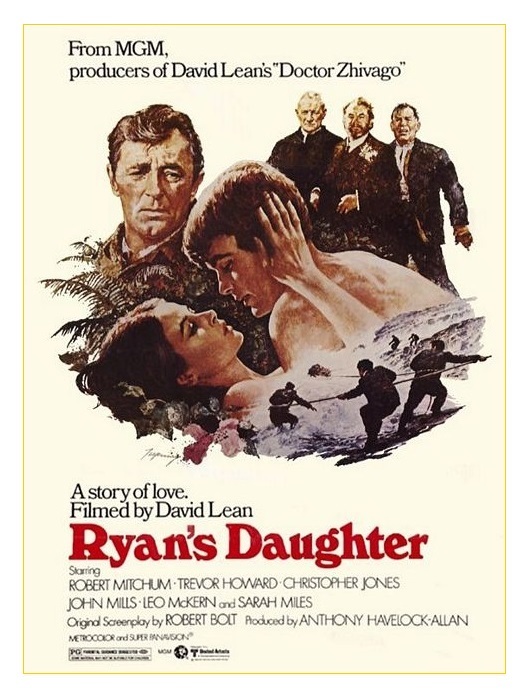 Ryan’s Daughter is not as good as The Bridge on the River Kwai or Lawrence of Arabia, but I liked it better than Doctor Zhivago. Because of its length — 3 1/2 hours — the film requires commitment from the viewer, but I think it is time well spent. By the way, this is a perfect film to watch on St. Patrick’s Day. Color, 206 minutes, Rated R.